Hermitage Magazine is dedicated to fine arts, architecture, theatre, cinema, music, literature, photography and current issues in modern culture worldwide. The magazine contains news from the museum world, exhibitions, projects, pressing issues in contemporary culture, the finest Russian and foreign private collections, meetings with interesting figures on the current art scene.Our readers are educated people for whom the arts may be their profession or a pastime interest. 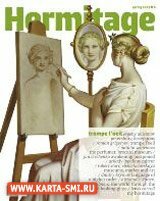 Hermitage Magazine comes out quarterly. Дополнительная информация о: Hermitage Magazine, доступна участникам клуба Карта СМИ. Для входа заполните поля справа, и нажмите кнопку "вход".